If you wished you had joined, you still can! 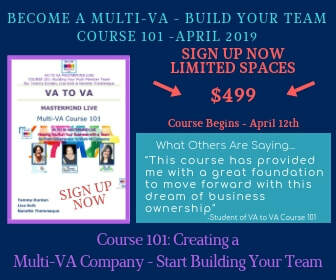 ​Become A Multi-VA - Build Your Team Course 101 - A six week course. A Great Value Towards Your Continued Success! A 6-Week Course with Three Experts of VA To VA Mastermind, Tammy Durden, Lisa Kolb, and Nanette Thelemaque. You all provide great real world examples to back up the information being presented. This course is an investment to more revenue and more opportunities. If you’re going to grow and if your business is going to scale, you need to invest in yourself. Take the steps NOW! Everything need to hit the ground running! We have created an Installment Plan to make it easy on your budget. Are You Ready to move to the next level with your business?